On May 25 1928, Airship Italia, commanded by Umberto Nobile, one of the founding fathers of Arctic exploration, crashed on the way back from the North Pole, about 120 km northeast of Nordaustlandet, Svalbard (81°14 N 28°14 E), killing part of the crew trapped in the still drifting airship envelope and leaving the survivors stranded on the pack ice. The crew managed to salvage several items from the crashed airship gondola, including a radio transceiver, a tent which they later painted red for maximum visibility, and, critically, boxes of food and survival equipment which quick-witted engineer Ettore Arduino had managed to throw onto the ice before he and his five companions were carried off to their deaths by the wrecked but still airborne airship envelope and keel. In the wake of the crash, a collection of nations, including Soviet Russia, Norway, Sweden, Finland, and Italy, launched the first polar air and sea rescue effort. Norwegian polar hero Roald Amundsen, first man to conquer the North and the South poles put aside his past differences with Nobile (who had built the Norge airship, the first aircraft to reach the North Pole, and the first to fly across the polar ice cap from Europe to America) and boarded a French seaplane and headed for the rescue headquarters. His plane disappeared between Tromsø and Svalbard, and though a pontoon from the craft was later found, the bodies of Amundsen, the pilot René Guilbaud and the four others on board were not. After a month, the first rescue plane, a Swedish airforce Fokker ski plane, piloted by Lieutenant Einar Lundborg landed near the crash site. Lundborg refused to take anyone but Nobile, who was airlifted to Ryss Island, base camp of Swedish and Finnish air rescue efforts. When Lundborg returned alone to pick up a second survivor he crashed his plane on landing, and was trapped with the other five. After 48 days on the ice floe, the last five men of his crew were rescued by the Soviet icebreaker Krassin. Nobile insisted that he wanted to continue the search for the six crew who were swept away by the airship when it disintegrated, but he was ordered back to Rome (by Mussolini) with the others. 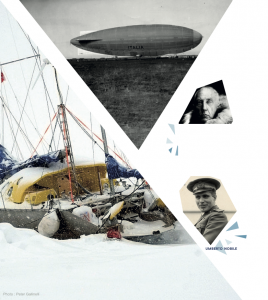 POLARQUEST will continue the search on board Nanuq with a pioneering attempt at relocating the sunken wreck of Umberto Nobile’s Airship Italia, on the 90th anniversary of its crash, taking advantage of the melting ice in the region for the first time in centuries. Nanuq will also attempt for the second time to circumnavigate the entire Svalbard archipelago and conclude its 2018 mission in Tromso, Norway.